Travel on remote mountain railway lines through dazzling Pyrenean countryside on this holiday to France and Spain. Based at the charming beach resort of Roses, on the Costa Brava, you’ll set off on some remarkable train journeys into the mountains to visit ancient sites and reach soaring summits with breathtaking views. Fly to Barcelona or Girona and transfer to the delightful Costa Brava resort of Roses, set beneath ancient fortifications on the sweeping Golf de Roses. Settle into your comfortable hotel and, depending on your arrival time, perhaps enjoy a stroll along the beach to the harbour and marina. All aboard the Roses Express! Today’s included excursion brings the chance to ride on a tractor-hauled tourist road train to the Cap de Creus Natural Park above the resort. This winding path climbs through wooded hills to reach a summit offering gorgeous views. Spend the rest of the day enjoying the highlights of Roses. This colourful, typically Catalan resort dates back to the Ancient Greeks, and a wealth of historical sites remain across the town. See the ruins of the 16th-century citadel walls and Trinitat Castle, as well as some fascinating ancient dolmen burial sites. Roses still functions as a working fishing port, and so seafood is the most popular fare here – don’t miss the local specialty, the suquet de peis, consisting of fish with potatoes. 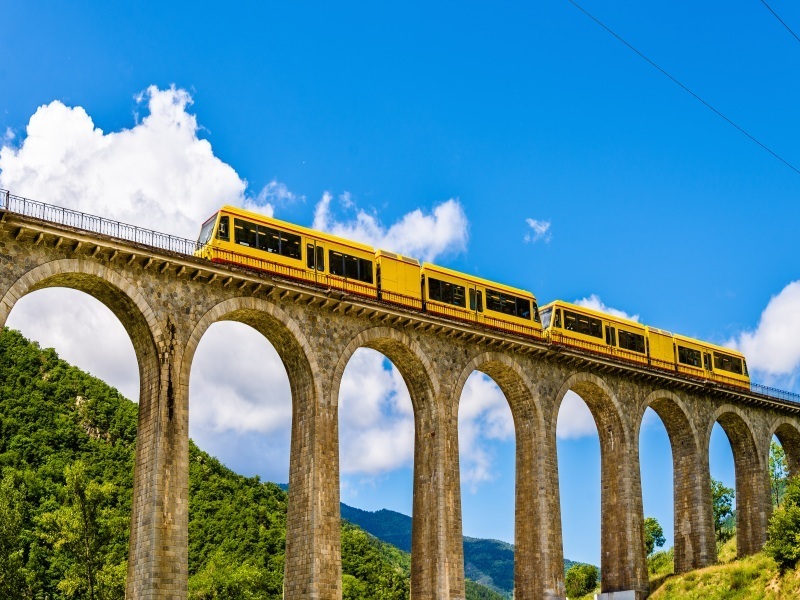 Today’s train journey aboard the historic Yellow Train, or Petit Train Jaune, takes us on a meandering trail through the sun-kissed French Pyrenees. We’ll begin our journey in the bucolic, UNESCO-listed town of Villefranche-de-Conflent and travel across soaring bridges and viaducts towards France’s highest station, at Bolquere-Eyne. Continuing through a spectacular mountainous landscape we’ll reach the commune of Mont-Louis, to explore its great citadel and city walls. Take in the beauty of the surroundings, and perhaps enjoy lunch (payable locally), before we make our way back to Roses by coach. Our excursion today takes us on a scenic trip through the Catalan Pyrenees. We’ll ride the two-car Nuria Rack Railway, or Cremallera, from the hamlet of Ribes de Freser up through a steep, forested gorge to Nuria. This remote ski station is the home of an ancient image of the Virgin Mary, which draws pilgrims from across the globe. Enjoy a stroll on the paths that cross the alpine meadows, and learn about the history of this extraordinary place, before re-boarding the train for the return journey down the valley and back to Roses. Crossing the border back into France we’ll board the hundred-year-old Train du pays Cathare et du Fenouilledes, more commonly known as the Red Train. This delightful journey takes us through the spectacular scenery of castle-dotted Cathar Country from Rivesaltes, near historic Perpignan, to the Pyrenean village of Axat. On fine days, travel in open-air summer wagons across viaducts and through tunnels, past the vineyard-clad lower slopes of the eastern Pyrenees. Return to Roses to enjoy a final evening in the town, perhaps glimpsing the sunset from the beach – Roses is the only Costa Brava resort to face west, meaning some evenings can be truly spectacular. Bid farewell to your Catalan hosts, and transfer back to the airport for the return flight to the UK.